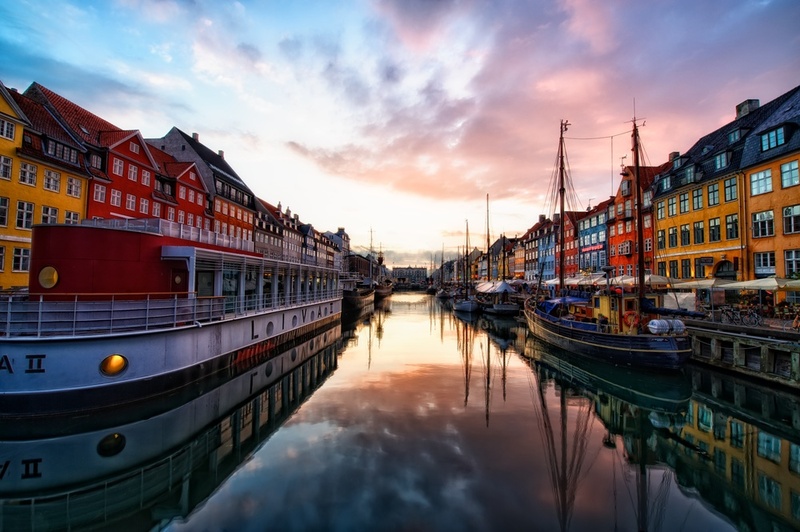 Nyhavn is a 17th century waterfront, canal, and entertainment district in Copenhagen, Denmark. It is lined with brightly colored townhouses, restaurants, and bars. The canal has all these historic wooden ships sitting there, providing some additional interest and "cool factor" to the whole scene. I just loved it here. Before coming to Copenhagen, I had seen some pictures and read about this area, and had it at the top of my list of "must shoot" locations (yes, I actually make a list before I travel somewhere - do you?). Despite being awake all night on the plane (a bad habit of mine that I can't seem to break), I ventured out my first evening there to grab some dinner and hopefully a nice sunset. It had been raining a bit - which can be a good thing - and after dinner the sky did decide to really turn nice for me! I was lucky that my shots that night didn't turn out all blurry, since I was a bit bleary-eyed myself! I have plenty more to come from this area, as I made it a point to visit it a few times during my stay in this awesome town!